BEEF BULGOGI IS A KOREAN DISH WITH THIN SLICES OF STEAK MARINATED TO PERFECTION AND GRILLED OVER HIGH HEAT PRODUCING DELECTABLE CRISPY EDGES ON TENDER SLICES OF BEEF. 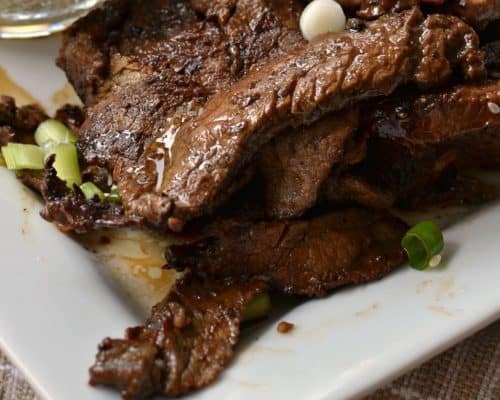 I just can not express to you just how wonderful this Beef Bulgogi is and with a little preparation it is quick and easy. You can use other cuts of beef besides flank steak to make this tasty recipe. Sirlon, tenderloin, petite shoulder or any good cut of marbled beef will work. The beef marinates for at least one hour and then I grill it at a high heat or flash fry in a little bit of hot oil in my cast iron skillet. TRADITIONAL WAYS TO SERVE BEEF BULGOGI. Serve with a bowl of steamed rice. Add onions, peppers, mushrooms and carrots to the skillet with the beef. Serve with Korean cucumber salad and noodles with kimchi. 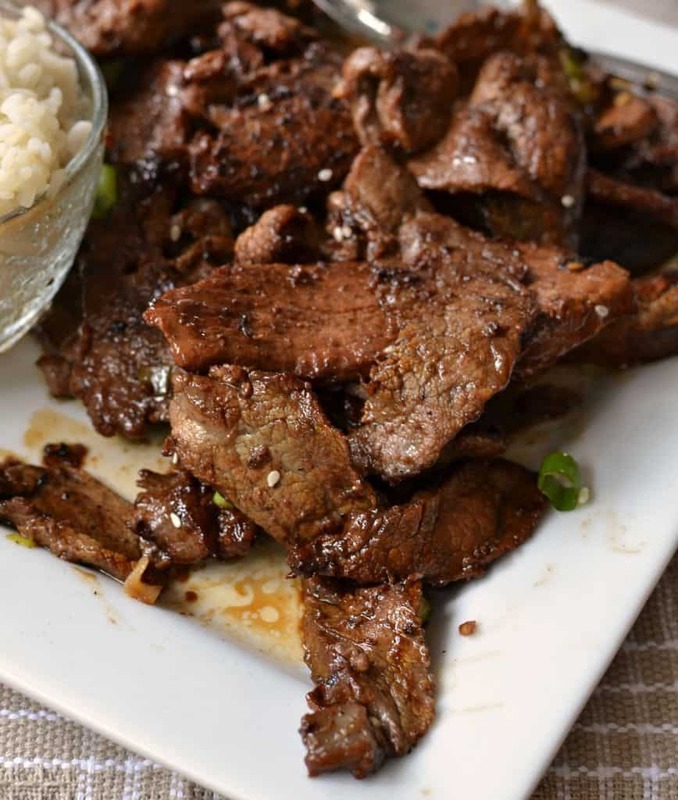 HOW TO MAKE BEEF BULGOGI. Slice beef as thin as you can. Freezing for a couple of hours helps with this. Place beef in large ziploc bag and add soy sauce, brown sugar, minced garlic, sesame oil, black pepper, grated pear and green onions. Marinate for one hour up to overnight. Heat cast iron skillet or grill (you will need a small grate so the beef does not fall through) to medium high heat. Add 1-2 tablespoons of oil to the skillet or brush grill grate with oil. Remove beef from marinade with tongs to drain marinade. Arrange beef in single layer and do not crowd. Cook beef in small batches resisting the urge to turn it until it is seared and crispy about 1-2 minutes. Serve immediately. 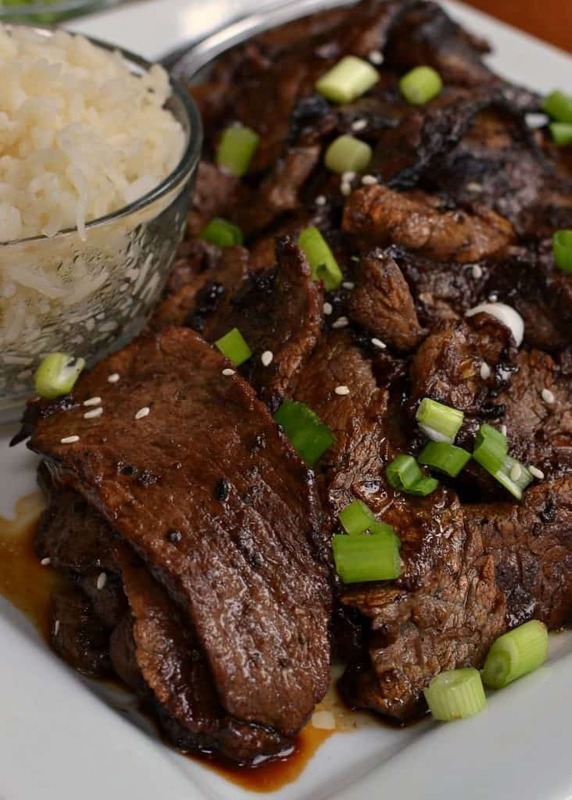 HELPFUL HINTS TO MAKE THIS BEEF BULGOGI RECIPE EPIC! Make sure you slice the beef as thin as possible so it cooks fast and gets crispy on the edges. Use tongs to remove the beef from the marinade draining as much as you can as this helps the beef cook properly. You want the beef to sear not boil. Resist the urge to turn the beef too soon or more than once therefore really searing it and getting it just perfect. 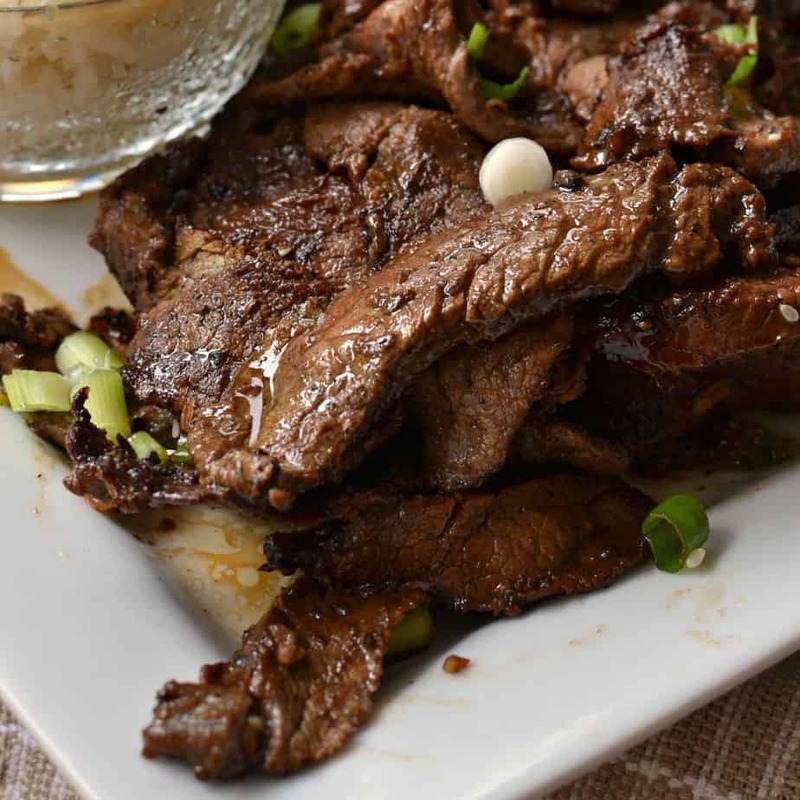 This bulgogi steak recipe will quickly become one of your favorite recipes. It is dependable, easy and amazingly delicious! MORE BEEF RECIPES YOU WILL LOVE! 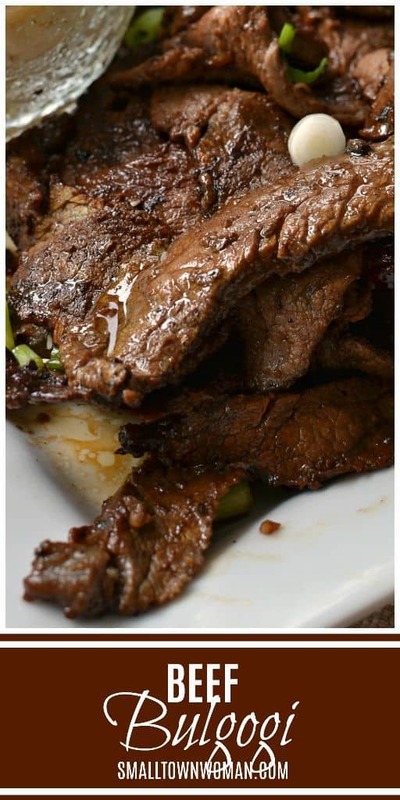 Beef Bulgogi is a Korean Dish with thin slices of steak marinated and grilled on high heat producing delectable crispy edges on tender slices of beef. Place steak in large Ziploc bag. Add soy sauce, brown sugar, garlic, sesame oil, pepper, green onion and pear. Marinate for at least one hour up to overnight. Add 1 tablespoon oil to cast iron skillet over medium high heat. Using tongs remove beef from marinade and place in skillet in single layer. Cook for 1-2 minutes per side or until browned and slightly crispy on the edges. Add more oil when necessary. Work in batches; plating the meat after it is done. Serve immediately. Asian pears and red pears can be hard to find. You can sub any ripe pear if necessary. This is similar to my Kalbi recipe, which is Korea bbq beef ribs, cut LA style: Thinly out from the side long ways so that tou end up with a thin piece of rib meat attached to the bone on one short end and probably six to eight inches long that can wrap around the bone for storage. I can’t always find pears that work, so I have successfully substituted apple juice in the marinade. All great ideas. Thanks for the tips!! This is so delicious! So easy and flavorful! I was so intrigued by this Korean beef recipe I had to make it. My family loved it so I will definitely make it again!